For the last several years Ford has partnered up with EAA AirVenture in Oshkosh, WI to auction off one-of-a-kind Mustangs to benefit the EAA Young Eagles program. The aviation themes have included the AV8R, the AV-X10 Dearborn Doll, the SR-71 Blackbird and last year’s Blue Angels Mustang, all of which have combined to raise more than $1.5 for the charity. Now in their fifth year of partnership, the Ford and EAA AirVenture announced last month that a Red Tails Mustang would be auctioned off at this year’s event, honoring the Tuskegee Airmen of WWII. The legendary African American pilots made up the 332nd Fighter Group and 477th Bombardment Group that served during WWII. The 332nd is the most known of the two, being the only operational unit and recording an impressive combat record in their missions in Italy and elsewhere in Europe. They flew with various airplanes including the P-39 Airacobra and P-47 Thunderbolt but are most commonly associated with their last plane, the P-51 Mustang. The group earned their nickname because of the red painted tails of their planes. Before the Red Tails Mustang goes to auction, though, we caught up with the car in Southern California where it was just completed by Creations n’ Chrome. The shop has gained quite a reputation for building some impressive show cars over the past few years, starting with the “Pony Girl” Mustang that debuted at SEMA in 2010, followed up by their equally impressive Boy Racer Mustang that was introduced at the 2011 SEMA show the following year. In between Creations n’ Chrome found the time to build the aforementioned Blue Angels Mustang featuring a unique chrome paint job for last year’s EAA AirVenture auction, and now they have followed that up with this year’s Red Tails Mustang. This unique 2013 Mustang started out like many that come from the factory, although Ford picked out a very specific car for the build – VIN number 00051 – to pay homage to the P-51 Mustangs flown by the Tuskegee Airmen. This car demanded more than a special VIN, though, and it was up to Creations n’ Chrome to turn the car into a vehicle worthy of six figure bids at auction. Like their previous projects, this Mustang needed a unique paint job, although Gary Watson, owner of Creations n’ Chrome, explained to us that it had be different than their chromed cars. To achieve the look Watson used a special paint from Spectra Chrome called Magic Chrome. In reality it’s not paint but rather microscopic particles of aluminum that provides a metallic look. “I used the Magic Chrome because I wanted to use a material that the plane was made out of,” Watson explained to us. To apply the ‘paint’ Watson first sprayed on a layer of glossy black followed by a layer of the Magic Chrome, then finally a layer of matte clear to give it a rough, unfinished look that might be on a vintage plane. The red and yellow trim are factory Ford colors – Race Red and School Bus Yellow – used to mimic the paint scheme of the P-51 Mustang flown by the 332nd Fighter Group - and all of the graphics on the car are hand-painted. The Red Tails Mustang also gets a unique look from a variety of components sourced from the Ford parts bin. The front fascia and grille are from the 2013 Mustang Boss 302 (the Laguna Seca front splitter had yet to be fitted), and the back end of the car gets the Laguna Seca wing as well as the rear fascia and quad exhaust system from the 2013 Shelby GT500. Speaking of the exhaust system, you might also notice the four exhaust pipes on each side of the car sticking out behind of the front wheels as a nod to the twelve exhaust tips protruding from the P-51 Mustang’s fuselage. Not only do they look cool, but they’re functional as well. Think of the Boss 302′s side pipes on steroids. As a final touch the faux gas cap on the back of the car features the emblem of the 332nd Fighter Group. For the interior the Red Tails theme continues, highlighted by a set of custom leather Recaro seats from a Shelby GT500. The stripes and trim are done in red, and the seats have been embroidered with a “Red Tails” script. Many of the other special details are less notable, though, like the red-trimmed seat belts, the Alcantara-covered Boss 302 steering wheel, the one-off gauges with the Red Tails logo, an aluminum shift knob, customized sill plates and floor mats with the 332nd Fighter Group logo. As a final touch Creations n’ Chrome also installed the rear seat delete and cross brake from the Boss 302 Laguna Seca. The Red Tails Mustang isn’t just about show, though. It had yet to be installed when we photographed it, but a Ford Racing supercharger good for 624 horsepower was scheduled to be installed under the hood at Roush’s facility in Livonia, MI before the car headed to EAA AirVenture. 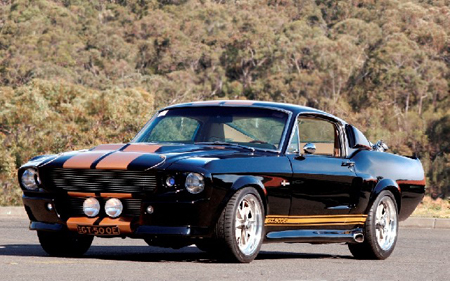 All of that power runs through a differential from the 2013 Shelby GT500 complete with 3.73 gears, and in the handling department the Mustang received Ford Racing’s handling pack complete with shocks, lowering springs and sway bars. Finally, a set of 20-inch Pirelli P-Zero tires were fitted over Forgiato Maglia wheels. Want to see the Red Tails 2013 Ford Mustang for yourself? It is currently on display inside of Ford Hangar at EAA AirVenture, which is honoring the Tuskegee Airmen as part of “the greatest generation in the air” all of this week. The car will be auctioned off to the highest bidder on Thursday, July 26th. For more details visit www.airventure.org. This entry was written by by MustangsDaily (Mustangs Daily) and posted here on Monday, July 23rd, 2012 at 7:30 am and is filed under creations n chrome, eaa airventure, Feature Cars, Headline, red tails, red tails ford mustang, red tails mustang. This article was not written by us, rather gathered using RSS feeds listed here. We take no credit for this article. You can leave a response, or trackback from your own site.